How do I add a payment to an invoice and show that it has been delivered? First, we'll start with the second part of this question. There are a couple of ways to show that items have been delivered. If you are going to deliver all the items in the invoice, the easiest way to do that is by clicking the "Mark items delivered" box under "options" in the edit stage of creating the invoice. When you are all done adding products to the invoice, and you have marked it delivered if you are in fact going to deliver those items right away, click "save." Save just says, "this invoice has all the products added and I want to move on to other things." It doesn't deliver the products unless you've checked the box and no payment has been added yet. Here's what that looks like. This is what you'll see once you have clicked "save." 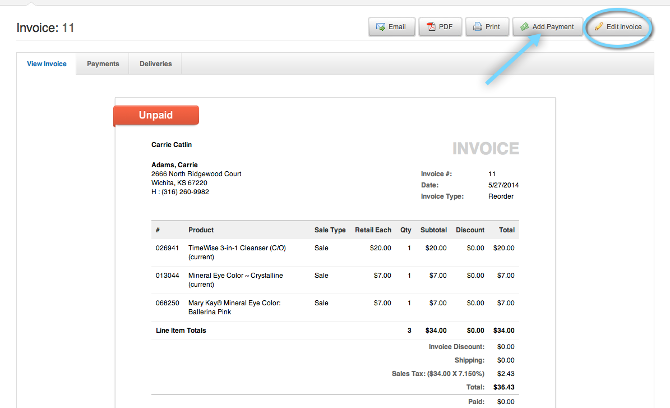 Now you can click "add payments." If you would like to enter a partial payment just enter the amount in the box you wish to apply to the invoice right now. You can go back and enter the balance later, once she has paid you. Click "Save." 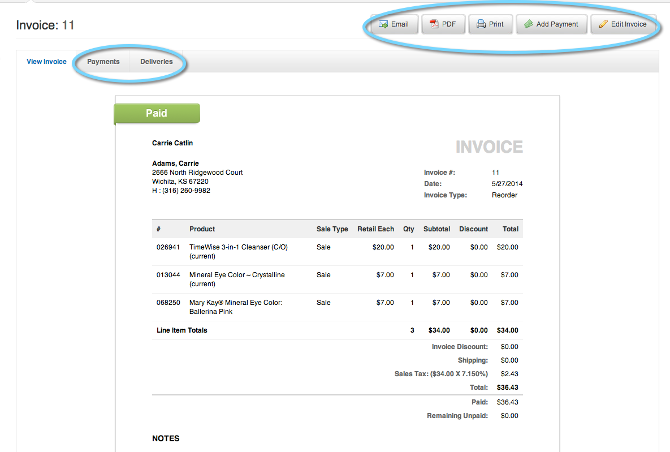 If you realize you need to add something to an invoice after it has been saved, simply click "edit." Now your invoice is paid. Notice all the choices you have with this invoice. You can always go back and edit it even after it has been paid and delivered. You will be given a pop up that will ask you if you want to reverse payment and deliveries. 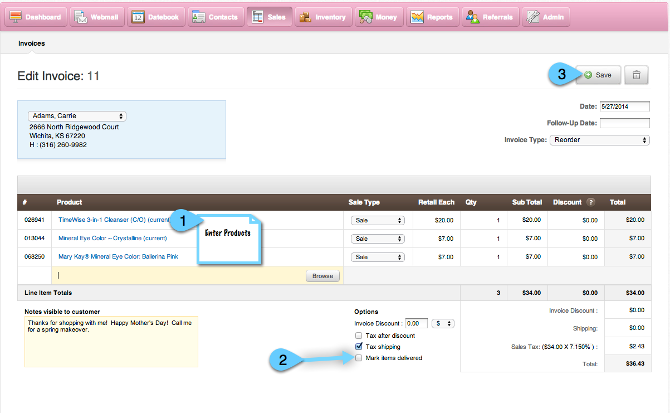 To see payments or delivery information and to add payments and deliveries you can click on the "Payments" and "Deliveries" tabs. Once you have left the invoice. Click on the invoice number to go back into it again.